Under the Direct Emulsion Technique of stencil preparation Bluecoat 090 is coated on the screens and within no time screen is ready for printing. Bluecoat Photo Emulsion is manufactured under standard conditions and strict quality control is maintained. Once the screen is exposed, it needs to be hardened with Bluecoat Hardener. 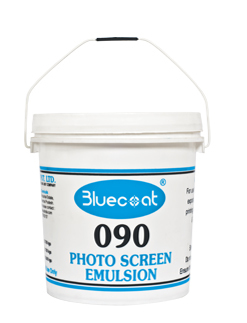 Sensitized Bluecoat 090 Emulsion has a shelf life of 2-3 weeks when stored at room temperature. 1 kg, 10 kg & 25 kg bucket packing.